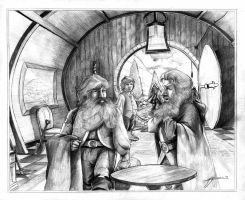 The suggester said: "The Hobbit movie has been announced already, and it is good to recapitulate the story quickly. In this picture you can find the entire journey there and back again. As Tolkien said: "It is a dangerous business going out your front door. You step onto the road, and if you don't keep your feet, there's no knowing where you might be swept off to.”"
Also suggested by many people too long to list! This is fantastic! Love the colours, the flow, the details... Absolutely awesome work! Seriously, I would buy a print... I want this as a poster. It's gorgeous! Please, please, please let me buy this as a print. Wow! Just wow! That is fabulous! Thanks ...have a happy new year! They sure were :> This picture is unbelievable! Speachless... amazing - I could have this on my wall, definetly! Heya, I commented on this long ago, but now I'm thinking of buying a large poster-size print of this once I can scratch enough money together, because as I said before.... this is just so so amazing. Wow, that's generous of you. But no, there's no one I know with a printer like that. But I gotta say man, you lost me with George floating above Silbury Hill. Who the hell is George!? Fantastic detail and colors !! this is pretty much the most epic thing ever. I'm in love. way to illustrate such a long and epic story in a single picture!!! my brain is melting.... theres so much in it!! This piece is so fun! Well done! This is incredible. I love the colors, the composition, everything! What medium did you use?